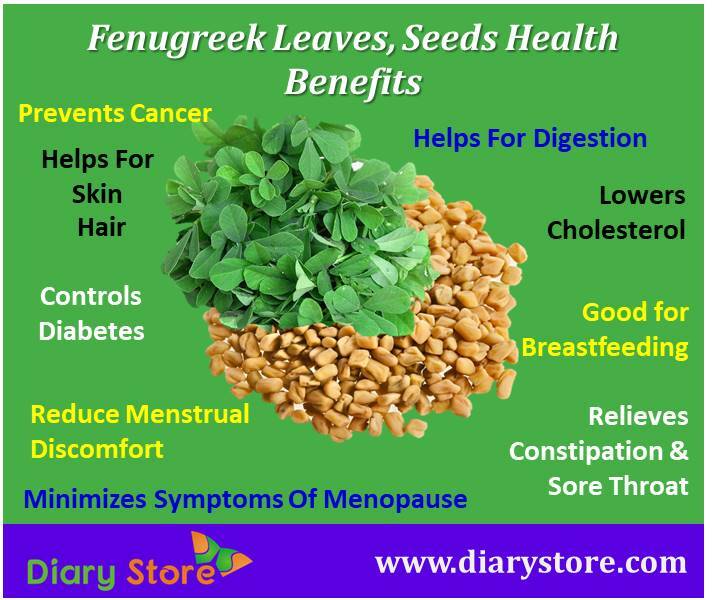 Fenugreek has amazing health benefits which can cure heart problems, diabetes, sore throat, constipation, menstrual discomfort, menopause, hair problems, skin problems, digestion problem, lower cholesterol level and can improve breastfeeding. Fenugreeks belong to Fabaceae family. Fenugreek plant is two to three feet tall and the seed pods contain 10-20 small seeds and the seeds are yellow- brown in color. They are bitter to taste. It is cultivated in North Africa, middle East, Egypt and India. Fenugreek can be used for three distinct purposes: The leaves can be dried and used as herbs, the plant can be used as a vegetable and the seeds can be ground into a culinary and medicinal spice. The plant grows across the globe but it is mostly consumed in India. Fenugreek leaves are used as ingredient in Indian curries; seeds and micro greens are used in salads. The largest fenugreek producers are India, Pakistan, Afghanistan, Nepal, Iran, Argentina, Bangladesh, France, Egypt, Spain, Turkey and Morocco. Fenugreeks have proteins and minerals. Here we list the nutrition value per 100 grams (3.5 Oz) and percentage of RDA (Recommended Dietary Allowance). Fenugreeks have compounds like diosgenin and iso-flavones with estrogen like properties which help reduce symptoms like discomfort and menstrual cramps associated with premenstrual syndrome. Those who are suffering from menstrual discomfort should add fenugreek in their diet. Fenugreeks are a rich source of fiber, which helps reduce the cholesterol level of the blood vessels of human body. It also reduces the level of low-density Lipoprotein significantly, thereby preventing conditions like strokes, heart attacks and atherosclerosis. Fenugreeks contain galactomannan which slows down the rate of sugar absorption into blood. Add fenugreek in the diet of type 1 diabetes patients to help to drop urinary sugar level. Fenugreeks contain high amount of fiber content. It is helpful to prevent constipation and diarrhea. It also relieves a sore throat, cough and pain. Fenugreeks act as an anti-microbial substance which helps bind the toxins and protects the colon’s mucous membrane, which can prevent colorectal cancer and other conditions. Fenugreeks contain magnesium and vitamins. It acts as a galactagogue, which increases women’s breast milk. 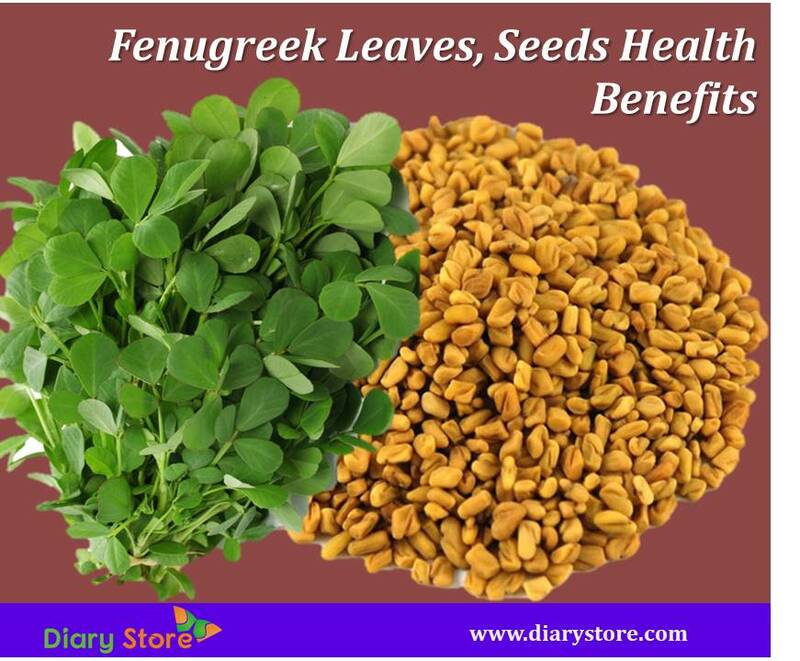 Fenugreeks are highly beneficial in reducing blemishes and skin marks. Take fenugreek seed powder, mix with a few drops of water, apply this paste to your skin, leave for a few minutes and wash with a wet cotton ball. Fenugreeks contain vitamins and minerals. Apply paste of fenugreek seeds to your scalp and leave it for a few minutes and wash with cold water. It prevents hair fall and keeps hair healthy and strong. Deficiency of estrogen causes menopausal problems. Fenugreek has estrogenic iso-flavones and diosgenin which help to reduce menopausal symptoms like depression, cramps and abnormal hunger pangs. Fenugreek removes harmful toxins from the body and aids digestion because it contains fiber and antioxidants. So, add fenugreek in your diet as it improves your digestion. During pregnancy fenugreek should not be added in the diet of pregnant women because it may lead miscarriage due to its strong effect on the female reproductive system.